We know that your pet is an important part of your family, and when it is ill, you would want the best medical care available. At Vetland Animal Hospital, we are proud to assist you and your companion animal(s) with a friendly, family-like atmosphere, combined with our dedication to uncompromising care. We offer a wide range of veterinary services to keep your companions at their best. From vaccinations, wellness and health stage examinations, to advanced diagnostic tests and complex surgical procedures - your dog, cat, rat or rabbit will receive high quality health care at our hospital. For the clients, we have an ever growing library section for you to browse through: from animals, adventure to religious and relationship books. We have something for everyone. But what use is a good book without freshly brewed filter coffee? Therefore, please ensure that when you visit us, to help yourself at our coffee bar. To create a truly first class hospital facility and high quality working environment for associates and a long term family relationship and experience with all our clients and patients. We aim to achieve this by making your visit a pleasant experience, both, for animals and humans alike. From front staff to veterinarian; we are all compassionate about animals as we are ourselves proud owners of a variety of pets. This means we have a better understanding of your special bond with your beloved pet; treating them with the love and care as we would do to our own. To provide the client with a high quality health care system for his/her pet. We are committed to promoting responsible pet ownership, implementing preventative health care and health-related educational opportunities for you, the pet owner. How do we do that? We practice Evidence Based Therapeutics (EBT). What does that mean? Ill pets mostly display symptoms that could often be due to a variety of causes. Isolating a single cause responsible for the variety of symptoms is the key word, when it comes to EBT. Tests would have to be recommended and performed in an effort to isolate and diagnose the underlying problem(s). At Vetland we do a wide range of tests, ranging from detailed blood analysis, urine/faecal analysis, to ultrasound and radiographs all in our in-house laboratory. This means immediate and reliable results to the benefit of the patient. Our Vetshop stocks all of the leading dog food brands, providing the pet owner with multiple choices of foods for his/her specific needs. But not just foods, also specialised veterinary prescription diets, education pet toys, preventative health schemes, grooming accessories, dental health treats, the list simply being too long to mention. Two waiting rooms allow us to accommodate the timid patients too. Many feline pets are often referred to the canine waiting room area, making the visit to the vet a total catastrophe and an utterly unnecessary evil. This is why we have the option of two waiting areas. Remember for your own peace of mind and safety to always have you dog on a leash and your furry cat in cat carrier. Two consulting rooms and a separate vaccination room, allow us to deal with various workloads, respecting the time restraints that most clients have in today’s busy lifestyle, linking this to our highly efficient and proven appointment system. Striving to be better, so there would never be a “please be patient - moment” for any client at the vet. Our separate preparation ward allows the clinician to perform various smaller tests, samplings or procedure with the absence of the owner. Many owners do not appreciate the sight of their pets being internally examined, samples obtained or minor treatments to be performed. Those clients are often recommended to relax at the coffee bar or take a walk through our beautifully kept garden or just sit on a bench under a shady tree, while the clinician will perform his/her duties. Should your pet ever need to be admitted for treatment, surgery or simply observation, you will be pleasantly surprised with our 5-star hospital ward. Each pet has its own spacious kennel (yes, inside as well as outside! ), can choose from at least 3 special Eukanuba pet food diets, have constant human interaction and will be taken for 3 hourly walks if the pet’s conditions or character allows the kennel men to do so. No need for your pet to have to sit in a kennel full of discharges........! Two ultra-modern, fully equipped surgical theatres, equipped with highly sensitive and specialised patient monitors, ensuring that the wellbeing of the anaesthetised patient is maintained throughout the anaesthetic and possible surgical procedure. Our Intensive care Service department is a fully functional unit that has saved thousands of pet lives since its inception. High quality digital radiographs enable the clinicians to make accurate diagnoses at the push of a button. Our dental theatre and equipment also enables us to treat and monitor the dental wellbeing of the patients. Providing them, just like us, with that Colgate smile. Those of you that have medical aid will be familiar with the term “medical aid rate”. This is the fee that your medical aid deems that a procedure should cost. Veterinarians are governed in a similar fashion by the South African Veterinary Council (S.A.V.C), which is their statuary body. The S.A.V.C recommends a minimum and maximum tariff for every procedure commensurate with practice facilities and standard of care. Vetland’s fees are charged according to the recommended guideline as proposed by the S.A.V.C. However, be informed that procedures and tests carry a price tag. As valued client you will always be advised as to what the best diagnostic and therapeutic options are for your pet, but the final choice will lie with you as to what should be done. 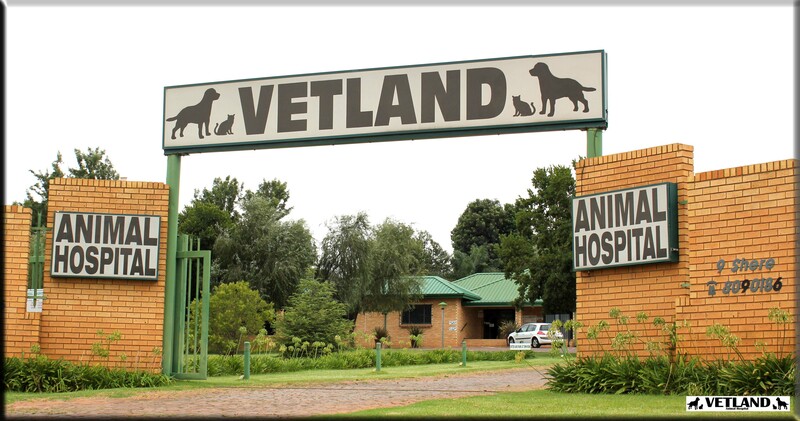 Vetland Animal Hospital has been in existence for over 20 years. With that in mind, a tiny history has developed and a lot of stories can be told. In 1993, a tiny townhouse, on the corner of Lynnwood and Hans Strydom/Solomon Mahlangu roads, was converted into Willow Glen Veterinary Clinic. The veterinarian in charge, Dr Peter Kirchner, together with his one assistant, worked many and long hours to make the practice survive initially and eventually grow. With growth came along more staff: receptionist, veterinary nurses, assistant veterinarians and skeleton staff. In the year 2000, proposed development on the property, forced the owner to move the practice to its current location , Plot 9, Lynnwood/Graham road - where it is now a first class Animal Hospital serving the community by caring for their beloved pets in a professional and loving way. Dr Kirchner built the practice with the vision of creating a truly first class animal hospital and a facility that provided a high quality working environment for its associates. To stay true to this vision and keep up with the surrounding municipal extensions, the practice had to be expanded in 2007, almost doubling in size, transforming it from a humble small veterinary clinic into a four man, modern, fully equipped veterinary hospital. Our credo: staying above the standards that the South African Veterinary Association endorses on veterinary facilities. The name Willow Glen veterinary clinic inevitably had to be changed to the current name Vetland Animal Hospital. Today you may find many clients having become friends of the practice and its staff often just visiting, enjoying a cup of coffee or a quick play date with “Lodi” - the practice rescue dog. Drs Peter & Irma Kirchner met at university, and married 2 years later, still as students, in 1990. Soon after graduating in 1992 and 1993 respectively, they both opened their own practices (Willow Glen Animal Clinic and Wilgers Animal Clinic), establishing them into proper veterinary facilities. However, long consulting hours and a wanting family life made them decide to join forces, selling Wilgers Animal Clinic in 2001, thus creating a dynamic partnership and marriage. Today, 20 years later, looking at where it all started and what has been achieved since, makes them stand in awe of their creator, humbly and thankfully receiving all His blessings.